Vancouver, BC – The Langara Falcons are excited to name Winston Brown as the new coach of the women’s basketball team. Brown, who has over two decades of coaching under his belt, has been an integral part of the Langara coaching staff for the past two seasons as an assistant coach. He succeeds Mike Evans, who spent the past fourteen years leading the women’s program. Prior to joining the Falcons, Brown coached the junior and senior girls’ programs at York House School in Vancouver. He led the Tigers to an impressive 10 straight AA Senior Girls Provincial Finals, capturing the provincial title seven times. Through ten seasons at York House he posted a regular season record of 108-8. As director of the Triple Threat Basketball Training Academy since 2003, Brown has spent countless hours coaching elite level athletes at the U15, U16 and U17 age levels. He has Bachelor of Education and Bachelor of Arts Degrees from the University of British Columbia and has been teaching at York House School since 2008. Brown has received both the Telus Basketball Classic Tom Tagami Award for Coaching Excellence (2012) and the Basketball BC Award for Coaching Excellence (2006 & 2011). 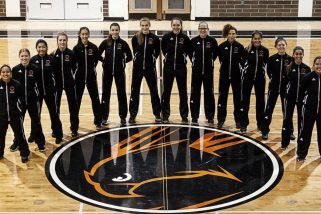 The 2016-2017 PACWEST women’s basketball season begins on Friday, October 28 when the Falcons play host to the Quest University Kermodes. Located in beautiful Vancouver, BC, Canada, Langara College provides University, Career, and Continuing Studies education to more than 21,000 students annually. With more than 1,700 courses and 130 programs, Langara’s expansive academic breadth and depth allows students of all ages, backgrounds, and life stages to choose their own educational path. Langara is also known as house of teachings, a name given to it by the Musqueam people on whose unceded traditional territory the College is located.